The wonderful, graceful packaging of this album shows the menacing posture of the praying mantis. On one hand, this alien looking creature is fearlessly proving his blades to us, yet on the other hand, this is a delicate being, placed on a delicate painting. This is somewhat similar to the way in which I find the music in this compilation album, produced by C-drik to be released on Syrphe. 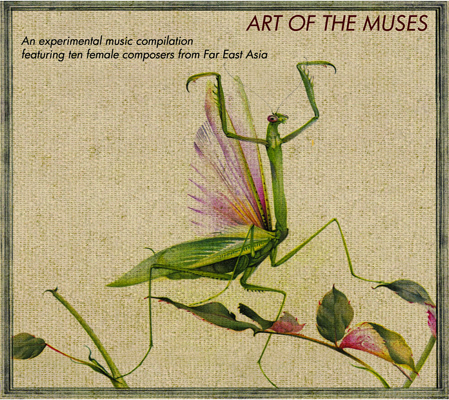 I have witnessed the sharp, piercing stings of sound and music among the various artists, all female composers from Far East Asia, yet every second of this album seems to be fine tuned into a magic moment grace, even if this grace has a sting. Parts of this album, like the wonderful opening track, utilize the human voice and let it act freely in empty spaces. Alice Hui-Sheng Chang opens the album in an unforgettable, unforgiving track that promises the listeners that fascinating mental surprises are yet to come. Aki Ito’s world of alien pulses and organic, minimalist percussions is a wonderful realm of paranoid meditation. On “Daboo” by Itta, it is an uncompromising shriek of unidentifiable instruments that becomes a monolith to be stared at with awe. Tomoko Sauvage’s watery world is an ear opening experience, rich with the aquatic lives of hundreds of tiny bells that gives me a full three dimensional view of her creation. Kismett’s epic ‘Snake-Rope Sublation’ combines a harsh static glitch interference with sublime sounds from the ninth sphere of heaven. Onwards. Vavabond brings us back into the claustrophobic, cavernous world of post industrial machine chants and iron alien loops. Pei goes into post apocalyptic overtones and introduces a rich world of miniature and magical occurrences. Verita Shalavita Koapaha gives a brilliant, nostalgic and traditional sounding moment of acoustic lamentation, and when it stops it is luong Hue Trinh who plays ‘Sumnabulism’, which is the longest track on this album. Spanning from minimalist ambient, through tribal awakening and psychedelic extravaganza, ‘Sumnabulism’ is a magnificent trip through acid jungles and brilliant revelations. Closing this album is Lau Mun Leng who produces a brittle, sensitive and touching requiem through the sharp sounds of a paper collapsing into itself. What can I say? Besides the fact that I would love to hear so much more from every contributing artist on this compilation album, this is a wonderful chance to get to know these wonderful composers, thanks to the blessed catalogues of international artists that is available through the label Syrphe. This album is a definite must on the shelves of everyone who even remotely interested in experimental music.